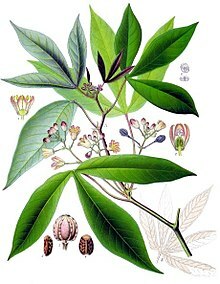 Cassava (Manihot esculenta), forby cried manioc, yuca, balinghoy, mogo, mandioca, kamoteng kahoy, tapioca-ruit (predominantly in Indie) an manioc ruit, a widdy shrub o the Euphorbiaceae (spurge) faimily native tae Sooth Americae, is extensively cultivatit as an annual crap in tropical an subtropical regions for its edible starchy tuberous ruit, a major soorce o carbohydrates. It differs frae the seimilar spellt yucca, an unrelatit fruit-bearin shrub in the Asparagaceae faimily. 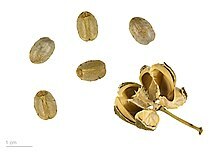 Cassava, whan dried tae a poudery (or pearly) extract, is cried tapioca; its fermented, flaky version is named garri.